2000s: Take the time to travel further around Newcastle with Kate Daniels – this time we visit the coast, the posh end of town and the West End of the city. With the eyes of the world on the World Cup taking place in South Africa, the bunting in the streets of Newcastle;s West End is out. People are watching with baited breath. Not far away, an arson attack on a seemingly abandoned house breaks up the party. At the same time, one of the worst traffic accidents on the A1 that the police have ever seen brings more carnage and mayhem to the region. There seems to be no link between the two incidents but this only goes to form a complex and gritty investigation where deadly deceit lies at its centre. The book opens in Newcastle’s West End – “in scenes reminiscent of the end of World War Two, the scruffy back lanes of Newcastle’s West End….” had been transformed for the party to celebrate the World Cup. The scruffy back lanes are Victorian terraces now scenes of mess and debris. An abandoned house is set on fire and the sense of fear and isolation is smothered by the loud music and drunken cries of the party. People here don’t venture outside their homes in an area where it paid to mind your own business. Be careful not to warrant a Scotswood Stare’ for example. Then immediately we are flung literarily into the biggest pile up the Northumberland force has ever seen. Bodies and carnage litter the road. The link to the house fire seems non existent but then why are some of the bodies not showing signs of having been in a crash? The sights, sounds, smells of the crash scene and echoing cries of those trapped will stay with you for a long time. The nature of the crimes committed here brings a much darker tone to Newcastle and its surroundings. 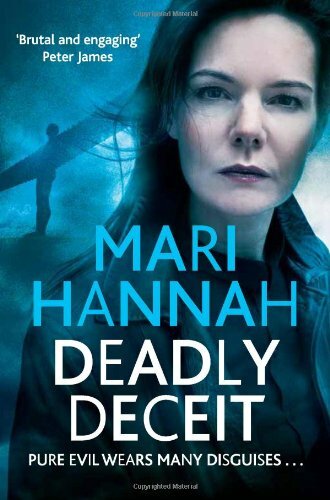 `Deadly Deceit’ is darker than blood. This is KAte Daniels patch – her home and she’s going to go the full distance in trying to sort out who is responsible, going the extra mile for the victims of crime. Kate, Hank and the team have some very tough choices and connections to make in this case.